Enrico Fermi, when asked about intelligent life on other planets, famously replied, "Where are they?" Any civilisation advanced enough to undertake interstellar travel would, he argued, in a brief period of cosmic time, populate its entire galaxy. Yet, we haven't made any contact with such life. This has become the famous "Fermi Paradox". Various explanations for why we don't see aliens have been proposed – perhaps interstellar travel is impossible or maybe civilisations are always self-destructive. But with every new discovery of a potentially habitable planet, the Fermi Paradox becomes increasingly mysterious. 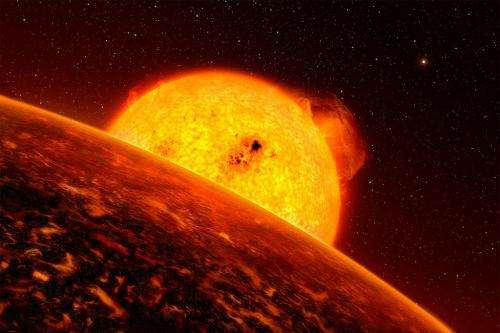 There could be hundreds of millions of potentially habitable worlds in the Milky Way alone. This impression is only reinforced by the recent discovery of a "Mega-Earth", a rocky planet 17 times more massive than the Earth but with only a thin atmosphere. Previously, it was thought that worlds this large would hold onto an atmosphere so thick that their surfaces would experience uninhabitable temperatures and pressures. But if this isn't true, there is a whole new category of potentially habitable real estate in the cosmos. So why don't we see advanced civilisations swarming across the universe? One problem may be climate change. It is not that advanced civilisations always destroy themselves by over-heating their biospheres (although that is a possibility). Instead, because stars become brighter as they age, most planets with an initially life-friendly climate will become uninhabitably hot long before intelligent life emerges. Over the past half-billion years, a time period for which we have reasonable records of Earth's climate, the sun's surface temperature increased by 4% and terrestrial temperatures should have risen by roughly 10°C. But the geological record shows that, if anything, on average temperatures fell. Simple extrapolations show that over the whole history of life, temperatures should have risen by almost 100°C. If that were true, early life must have emerged upon a completely frozen planet. Yet, the young Earth had liquid water on its surface. So what's going on? The answer is that it us not just the sun that has changed. The Earth also evolved, with the appearance of land plants around 400m years ago changing atmospheric composition and the amount of heat Earth reflects back into space. There has also been geological change with the continental area steadily growing through time as volcanic activity added to the land-mass and this, too, had an effect on the atmosphere and Earth's reflectivity. Remarkably, biological and geological evolution have generally produced cooling and this has compensated for the warming effect of our ageing sun. There have been times when compensation was too slow or too fast, and the Earth warmed or cooled, but not once since life first emerged has liquid water completely disappeared from the surface. Our planet has therefore miraculously moderated climate change for four billion years. This observation led to the development of the Gaia hypothesis that a complex biosphere automatically regulates the environment in its own interests. However, Gaia lacks a credible mechanism and has probably confused cause and effect: a reasonably stable environment is a precondition for a complex biosphere not the other way around. Other inhabited planets in the universe must also have found ways to prevent global warming. Watery worlds suitable for life will have climates that, like the Earth, are highly sensitive to changing circumstances. The repeated cancelling of star-induced warming by "geobiological" cooling, required to keep such planets habitable, will have needed many coincidences and the vast majority of such planets will have run out of luck long before sentient beings evolved. However, the universe is immense and a few rare worlds will have had the necessary good fortune. It may just be that Earth is one of those lucky planets – a precious, fragile jewel in space. So, perhaps inevitably, climate change will remain a bane of the continued existence of life on such planets. There has GOT to be some sort of award for this level of silly theorizing that manages to "connect" two hot button topics with a delicate bridge of hot air. Perhaps the "von Daniken Metal." I seem to remember when there was no "proof" that there were other planets in the universe. Then there was no proof that any of them were earth-like. Now they argue about a stable environment, as if Earth is the only planet able to achieve a balance. If you just use your imagination and statistics, you can pretty well figure out that there are other planets like ours with a long term favorable climate. This all, of course, begs the question of why intelligent life has to evolve on a planet like ours. Again, statistically, life, and therefore intelligent life, could arise in any sort of environment. It may well be that the reason we haven't been contacted by another form of life is that they consider us dangerous, or too stupid to deal with. As we have not a single fact at this point, it's all speculation - but what the heck. This news yesterday 6-9-14 "Researchers find major West Antarctic glacier melting from geothermal sources" This comes from researchers at the Institute for Geophysics at The University of Texas at Austin (UTIG) report in the current edition of the Proceedings of the National Academy of Sciences. Why is this story being avoided? Where is it in the list of "Related Stories"? The news about it melting, because of "Global Warming Climate Change Disruption" was all the rage a few weeks ago...What the heck? It's almost like there is a bias in the reporting. Like the "Science" is being "Denied". Naw! They wouldn't do that, would they? Perhaps this is due to the fact that our sun is a dying magnetar, and began life as a monopole which, until 650,000 mya, made the core of our Earth too hot to enable life. At this time, perhaps, the sun's energy loss permitted a dipole Earth to gain supremacy over the previous monopole which due to lower energy striking Earth, allowed life. Note that science has discovered that comb jellies with an evolved physiology were discovered to be the first life. I suggest this life was begun in the monopole phase of our sun. Later, as this life was not able to persist due to the monopole being replaced with dipole over 50 % of the time, sponges then began life again but their life is indicative of the dipole sun. Now, we have almost no monopole cycle as it only appears as a 'delayed' magnetic reversal. Wonder how much money was wasted on this. But then, when it is to support the AGW lies, it is money well spent. I think the great thinker Maynard James Keenan said it best: "Learn to swim"
How many starships can we launch into the blind with no reported feedback? Even a modest interstellar adventure requires such great expense and perseverance while offering no obvious benefit whatsoever to the fledgling originating civilization, apart from the development of new technologies. Technologies that we have seen from our own civilizations' space adventures are poo-pooed by the general populous. Solar energy had a very good start 100 years ago. Higher profit was the reason we turned to fossil fuel. Look at http://www.eia.go...mp;aid=1 to see how much is being burned worldwide. It may be that due to geology on other planets they may decide on solar collectors. They may also have different driving emotions that aid in their survival. Our civilizations that rely on kings to determine our future may not exist in a dispersed cooperative alien dry land population. More than 10,000 years ago we did not have kings or war. We were dispersed because without domesticating and inventing everything we now use, large populations couldn't survive. Their food chain would not support past a maximum number like a bee hive. You can have civilizations in different states depending on what decisions are made based on what or who is in power. There are many wrong ways and very few right ways to continue the species. The lunacy knows no bounds! Hell, there aren't even any AGWites here. Even they recognized the absolute stupidity on display in this article. "Our planet has therefore miraculously moderated climate change for four billion years. This observation led to the development of the Gaia hypothesis that a complex biosphere automatically regulates the environment in its own interests." Oh yeah! That idea belongs in a scientific blog as much as me declaring that God wants us to burn more fossil fuel to prevent us from entering another ice age. It is not "Gaia" - it is WATER and WATER VAPOR that thoroughly dominate the regulation of earth's temperature, (which is why God put it here and saw that it was good!). Can anybody give me a logical answer to this question: Who and what they may profit from instantly arguing until they are blue in the face whenever the two term "Temperature" and "Earth" are seen in once sentence, no matter what the main subject is? Is it a newly discovered pathology? Vorlez - Did you hear that? Zoltar - Yes. It's coming from that planet, where they believe their CO2 is going to destroy everything. Volez - Should we tell them, that's a lie. Zoltar - Nah, they are idiots. Volez - Well, in that we have consensus. Another peer reviewed paper, no doubt. I vote for Rupert Sheldrake's 'morphic resonance'. However, the universe is immense and a few rare worlds will have had the necessary good fortune. It may just be that Earth is one of those lucky planets – a precious, fragile jewel in space. With every advance in the field and every new variable added the principle of mediocrity gets further and further away from our "average planet" around our "average star". We better take care of it, because we're quite likely "it" within billions of light years....maybe even the observable universe. And how many cars do we have now that can cross hundreds of miles in a single day when our ancestors couldn't even conceive of such a journey in such a short time. If there ever was anything out there we should see evidence of it today our notions of economics and technology simply don't apply to this scenario on huge timescales. Applying modern human concepts to an alien civilization billions of years old is like comparing an anthill to Manhattan. You know it's a serious article when they give "civilisations" the British spelling. Silliness in the quest for funding knows no bounds. I beg to disagree. The hot nights are perfect for watching the green men on the sky instead of regular sleeping. From the same reason most of UFO observations has been made over summer. We probably haven't heard from other intelligent beings because we are separated by many, many light years and a faster than light drive, given the laws of the universe, is likely impossible. If closer planets that can be reached by ordinary means are available, intelligent beings would devote their efforts to making their own planet and those nearby planets into durable life supporting planets. Why squander resources on expensive explorations that take lifetimes and have unknown, likely adverse, outcomes? The one exception would be if their entire system was threatened and they had the time (which would be unlikely) they might appropriate an asteroid or comet, turn it into a life supporting ship and leave to find another system. That would take a long time to be successful and if they found another system they probably wouldn't want to do it again, especially not just for fun. Wonder how much money was wasted on this. But then, when it is to support the AGW lies, it is money well spent. Maybe antigoracle and the other anti-AGW drum bangers here simply failed to notice that the article isn't about AGW at all, but rather addresses changes in solar flux over the lifetime of the Sun. ". We can estimate the amount of warming this should have produced thanks to the scientific effort to predict the consequences of man-made greenhouse-gas emissions." "These models predict that our planet should warm by a few degrees centigrade for each percentage increase in heating at Earth's surface. This is roughly the increased heating produced by carbon dioxide at the levels expected for the end of the 21st century. (Incidentally, that is where the IPCC prediction of global warming of around 3°C centigrade comes from.)" PhysOrg will print anything that has the phrase Global Warming or Climate Change embedded in its text and lacking skeptical comments. This little screed is proof positive. "... Other inhabited planets in the universe must also have found ways to prevent global warming. ..."
Considering that the Sun is the primary source for heating the Earth, it may be and probably be that extra-Solar--civilizations have adopted a more Tai Chi approach, going with the thermal flow as it were, taking mechanical advantage of these periodic increases (and decreases) of thermal energy = an alternative energy source. Is thus and ever shall be: many researchers follow the money ... its called capitalism. If g'ment puts up the bucks for research, no matter the amount, some smart folks will go for it. See NOAA's fleets of cruise ships in the Pacific, making the rounds between the SF Bay Area, Oregon and Seattle, and the Islands ... "they got surfin' too".